Like aluminum, copper is one of those metals that is 100% recyclable and doesn’t experience any loss of quality regardless of whether it comes from a manufactured product or is mined in its raw state. In the United States, copper is the third “most often” recycled metal following aluminum and iron. Perhaps the most fascinating statistic is that experts believe as much as 80% of the copper that has ever been mined on this planet is still in use by man today. It has also become financially lucrative to recycle copper in the Cape Cod area and around the globe for businesses and scrap metal recyclers as well. Millions of dollars can be saved each year through the use of recycled, recovered and reprocessed metals in automotive and industrial manufacturing. As a bonus, recycling these materials helps to preserve important non-renewable resources for our future. There are a couple of scientific and industrial terms that are used to describe copper. First, it is known as a non-ferrous metal in terms of recycling and reuse in that it is a non-magnetic metal. It shares attributes with both gold and silver, leading it to be categorized in the same group on the periodic table. Man has literally been using copper for thousands of years for more uses than could be listed in this article. It has been historically documented that it was mined on Cyprus during the Roman era. Its compounds have been used as pigment, in architectural design and decorative art. Copper is an essential trace nutrient for plants and living organisms, so it is frequently used in nutritional supplements and fertilizer. Copper is naturally found in lower concentrations in the human body, most commonly in bone, muscle and the liver. It is used in industry as an excellent conductor for electricity and heat and is also mixed with a variety of other chemicals to create alloys. Copper is also very ductile, which means that it performs well under stress and can be stretched thin into wire. There are many different uses for copper in its many different forms. We use copper today more than ever before. According to the annual Metal Stocks in Society Report, developed countries use approximately 140-300 kilograms per capita, with less-developed countries using between 30 and 40 kilograms. Because of this increase in use and drop in global reserves, the price of copper has jumped dramatically over the last decade. Today’s copper reserves are still quite large, however due to an increase in use in growing and developing countries around the world, our international reserves will not be able to sustain the current rate of consumption. Beginning in the year 2000, demand jumped by a sizable amount as countries such as China began increasing use in industrial and technological development. 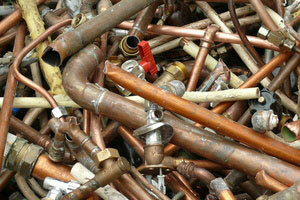 How Can I Get the Best Price for Copper in Cape Cod? In order to get the best price for your scrap copper it is important to understand about the different kinds of scrap copper that can be recycled. For example, die cast parts are typically the most sought after type of copper scrap and will get you the highest price paid for copper in Cape Cod. Scrap metal that comes from electrical motors or generators and copper wire are also very desirable and will yield a considerable rate per pound. Recycled copper is worth as much as 90% of the cost of copper in its original form, but it costs less to process recycled copper than it does to mine and extract new copper from the earth. Studies show that 15% of the energy used to extract and produce virgin copper is saved by processing recycled copper materials. This lowers costs for manufacturers and reduces pollution in industrial areas. Where Can I Recycle Copper on Cape Cod? If you live in the Cape Cod area, Mid City Scrap Iron and Salvage, Inc. in Westport, Massachusetts should be at the top of your list for copper recycling. A family-run business, Mid City Scrap has been operating in the Cape Cod area for generations, processing tons of ferrous and non-ferrous scrap metals each year. You can contact them toll-free at 1-800-334-4789 or locally at 508-675-7831 to get more information about current copper recycling prices in Massachusetts or for directions to their location.